In the late 1940s, 3M pioneered the discovery and manufacturing of PFASs (polyfluoroalkyl compounds) for use as a non-stick coating. The process to make these compounds (electrochemical fluorination) was used until 2001. Environmental chemists and biologists have determined that PFASs may have harmful toxicological effects and pose a significant risk to the public. 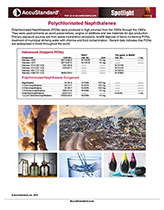 The USEPA published Method 537 for the determination of selected polyfluorinated alkyl acids in drinking water (14 compounds) by LC/MS/MS. Since the method’s publication, researchers have also identified an additional 10 compounds of concern. Polychlorinated Naphthalenes (PCNs) were produced in high volumes from the 1920s through the 1950s. They were used primarily as wood preservatives, engine oil additives and raw materials for dye production. Primary exposure sources are from waste incineration emissions, landfill disposal of items containing PCNs, treatment of municipal drinking water with chlorine and food contamination. Recent data indicates that PCNs are widespread in foods throughout the world. Now that recreational cannabis is legal in Canada, Health Canada (HC) will be testing cannabis residual pesticides, cannabis residual solvents, cannabinoids and heavy metals. 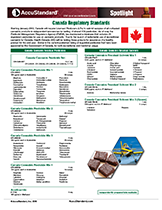 A comprehensive line of these standards for the Canadian methods are now available. 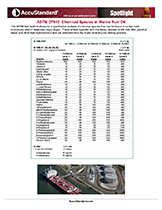 This ASTM test method allows for a quantitative analysis of chemical species that can be found in bunker fuels (commonly used in deep-sea cargo ships). These tankers typically burn the heavy residual oil left over after gasoline, diesel and other light hydrocarbons that are extracted from the crude oil during the refining process. 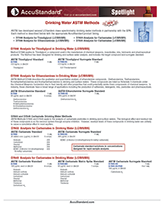 ASTM Method D3606 was developed to quantify benzene and toluene in finished motor and aviation spark ignition fuels. 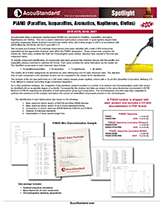 An additional standard is now provided for the 7 level calibration set which includes ethanol at approximately 10% v/v for all 7 levels. 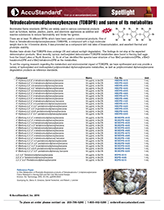 Limits for the amounts of elemental impurities in drug products are specified by The United States Pharmocopeia (USP) and the International Conference on Harmonization (ICH). The following standards are based off these limits as detailed in USP General Chapter 232 and ICH Guideline for Elemental Impurities Q3D. Standards based on oral permitted daily exposures are provided along with an internal standard. 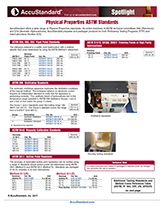 High and low level multi-element calibration standards that allow quantitative analysis through custom applications will be available soon. Products include: PIANO, PIANO-ETOH (with the addition of Ethanol), and PIANO-MTBE (with the addition of MtBE). 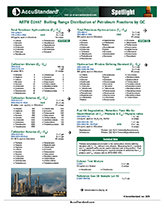 These products contain a comprehensive data package which identifies 214 individual compounds (79 paraffins/isoparaffins, 63 aromatics, 73 naphthenes, and 48 olefins). Extracted ion plots, retention times, and a master list of all of the components will be provided for comparison (on CD). This far exceeds any other available data package. Biodiesel is the most commonly used alternative fuel. It is made via conversion of vegetable and animal fats into fatty acid methyl esters (FAMEs). This fundamental difference between biodiesel and hydrocarbon-based petroleum diesel imparts properties to the biodiesel such as a high freezing point (-5 °C) and poor oxidative stability that render it unsafe in jet fuel. For example, at low temperatures biodiesel forms wax crystals that can clog fuel lines and filters. ASTM has developed several LC/tandem mass spectrometry drinking water methods in partnership with the EPA. 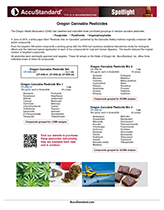 In June of 2015, a white paper titled “Pesticide Use on Cannabis” published by the Cannabis Safety Institute originally contained 188 active compounds. From the targeted 188 active compounds a working group with the OHA had numerous analytical laboratories study the toxicological effects and the historical natural application of each of the compounds for crop and human digestion. The results reduced the original number of targeted compounds. 59 pesticides were eventually approved and targeted. These 59 remain on the State of Oregon list. 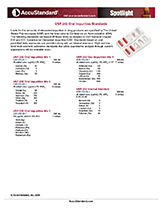 AccuStandard, Inc. offers three individual mixes of these 59 compounds. 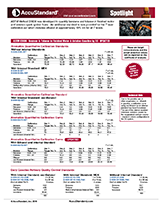 AccuStandard offers a wide range of Physical Properties ASTM standards. As active members of ASTM technical committees D02 (Petroleum) and D16 (Aromatic Hydrocarbons), AccuStandard prepares and packages products for both Proficiency Testing Programs (PTP) and Inter-Laboratory Studies (ILS). Tetradecabromodiphenoxybenzene (TDBDPB), a compound with a high molecular weight with 14 bromine atoms, was promoted as a compound with low rates of bioaccumulation and excellent thermal and photolytic stability. Studies show TDBDPB undergoes natural sunlight degradation. Recently, debromination products and various methoxylated debromiated TDBDPB have been found in gull eggs. 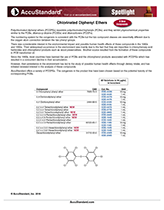 We have synthesized and now provide a variety of hydroxylated and methoxylated, as well, polybrominated diphenoxybenzene degradation products as reference standard. Polychlorinated diphenyl ethers (PCDPEs) resemble polychlorinated biphenyls (PCBs); and they exhibit physiochemical properties similar to the PCBs, dibenzo-p-dioxins (PCDDs) and dibenzofurans (PCDFs). Concern over enviromental and health-related factors associated with phthalates has led to restrictions of use in a wide array of products. This has resulted in the plastics industry generating a variety of alternatives. 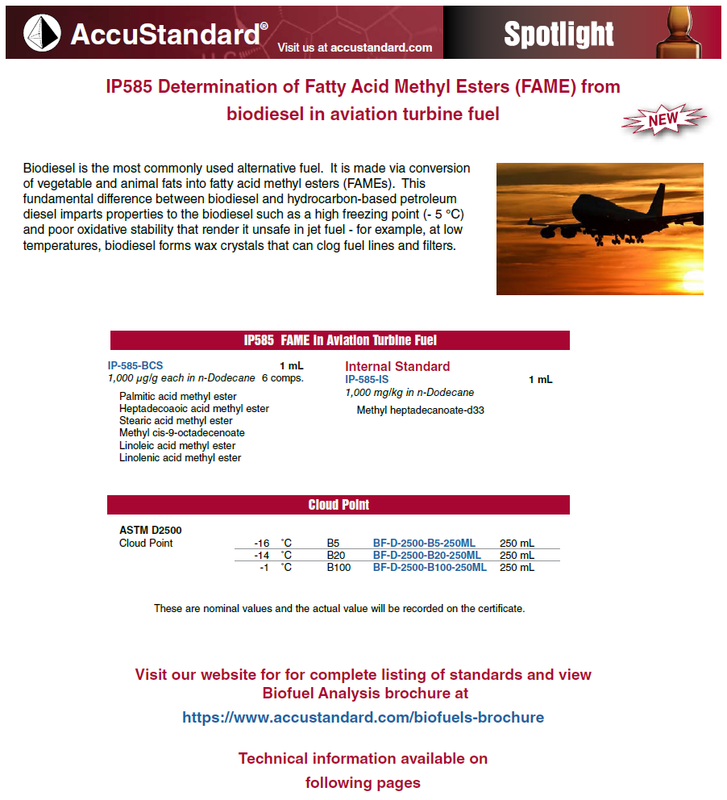 In response, AccuStandard has developed a phthalate replacement standards product line comprised of 42 compounds representing 18 chemical classes. There is much concern about potential short and long-term adverse health effects and environmental contamination associated with the fracking process. These biocides are part of our 217 biocide product line that was developed for the EU Biocides Regulation 528/2012. Bisphenols are endocrine disrupters that exhibit hormone-like properties. This raises concerns about their use in polycarbonate based household products as well as medical devices. Halobenzoquinones (HBQs) are disinfection by-products formed by reactions between disinfectants and organic matter in water. HBQs likely exhibit carcinogenic properties due to their structural similarities with benzoquinone and related compounds. 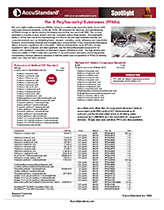 Organophosphate compounds (OPs) are high production volume chemicals. They are utilized as flame retardants and plasticizers, antifoaming agents and additives not only in plastics, but in paints, lubricants and hydraulic fluids as well. The chlorinated OP compounds like tris(2-chloroethyl) phosphate and tris(1,3-dichloro-2-propyl) phosphate are flame retardants used in both flexible and rigid polyurethane foam (e.g. furniture foam, thermal insulation), rubber, textile coatings, and home electronics. OPs have been detected in indoor air and house dust, surface, ground, and even drinking water. Ongoing toxicological studies have shown several toxic effects of these compounds, prompting the recognition of potential ecological and human health concerns of neurotoxin and carcinogenic nature.